I have been to many intesting places in the world, but I loved this view of the Mediterranean. 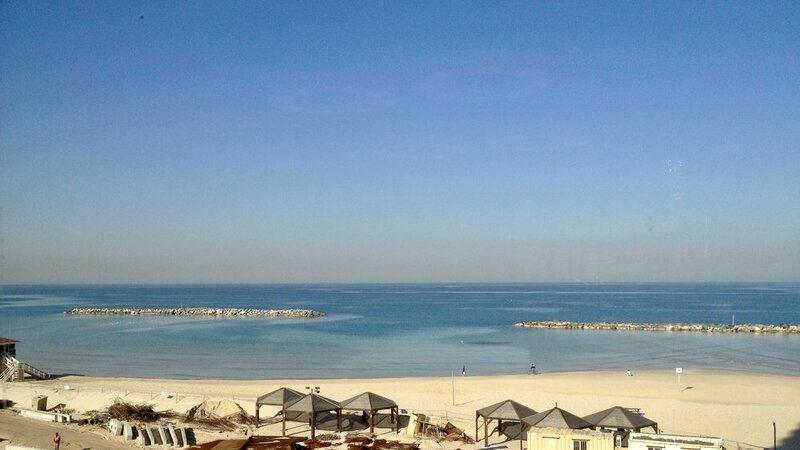 This was one of many warm days on the beach in Tel Aviv, Israel. I stayed in a hotel right on this beach many nights over a four year period, and on most of those days, this was the view. I was there for some very stormy nights. but that was the exception. I have never tried to rate locations. Every corner of this amazing earth has some unique quality that makes it special. Israel is no exception. I loved it there. The people were bright, friendly and amazing. The culture is special. It is one of those places I love to visit, and hope I can go back again sometime before my time is up on this amazing earth. Teresa and I went on a hike yesterday and I was able to fly the drone. I did that in some snow, but it was a lot of fun. The video can be viewed below or on YouTube. We made it to Myrtle Beach .. and I guess just in time. We will not be here for the hurricane, if it comes to that. It’s hard to believe that such beauty today could become so bad later this week. Wherever you are, have a safe and productive week. We plan to blog every day, and post at least 3 videos this week. I actually posted one today (Below). This was photos and video form our hike on Friday afternoon. Enjoy.